Four miles southeast of the village of Matfield Green in Chase County, Kansas—the heart of the Flint Hills—lies the abandoned settlement of Thurman. At the turn of the century Thurman was a prosperous farming and ranching settlement with fifty-one households, a post office, two general stores, a blacksmith shop, five schools, and a church. Today, only the ruins of Thurman remain. Joseph Hickey uses Thurman to explore the settlement form of social organization, which—along with the village, hamlet, and small town—was a dominant feature of nineteenth- and early twentieth-century American life. He traces Thurman's birth in 1874, its shallow rises and falls, and its demise in 1944. Akin to what William Least Heat-Moon did for Chase County in PrairyErth, Hicky provides a "deep map" for one post-office community and, consequently, tells us a great deal about America's rural past. Describing the shifting relationships between Thurmanites and their Matfield Green neighbors, Hickey details how social forces set in motion by the American ideal of individualism and the machinations of capitalist entrepreneurs produced a Darwinian struggle between Thurman stock raisers and Flint Hills "cattle barons" that ultimately doomed Thurman. Central to the story are the concept of "ordinary entrepreneurship" and the profoundly capitalist attitudes of the farmers who settled Thurman and thousands of other communities dotting the American landscape. 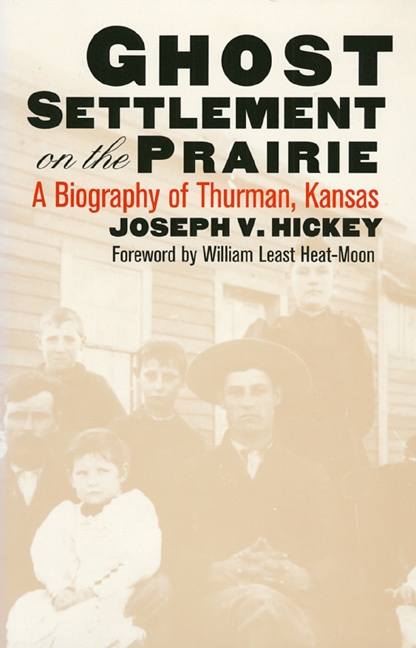 Hickey's account of Thurman's social organization and disintegration provides a new perspective on what happened when the cattle drives from Texas and the Southwest shifted in the 1880s from the Kansas cowtowns to the Flint Hills. Moreover, he punctures numerous myths about the Flint Hills, including those that cattle dominated because the land is too rocky to farm or that Indians refused to farm because of traditional beliefs. Like many other small rural communities, Hickey argues, Thurman during its seventy-year history was actually several different settlements. A product of changing social conditions, each one resulted from shifting memberships and boundaries that reflected the efforts of local entrepreneurs to use country schools, churches, and other forms of "social capital" to gain advantages over their competitors. In the end, Thurman succumbed to the impact of agribusiness, which had the effect of transforming social capital from an asset into a liability. Ultimately, Hickey shows, the settlement's fate echoed the decline of rural community throughout America.